It's hurricane season, and for those people living near the Atlantic, Pacific and Gulf of Mexico, it's a period of awareness and preparedness. At home, we know to stock up on water, non-perishables and flashlights, and we have an emergency plan in place. But, we often don't even think about how to protect our place of work. With offices in Jacksonville, Orlando and Tampa, we have to monitor both the Atlantic and Gulf Coast every hurricane season. We follow our own hurricane advice faithfully and like many of our clients, our business continuity plan is ready in the event of a disaster. 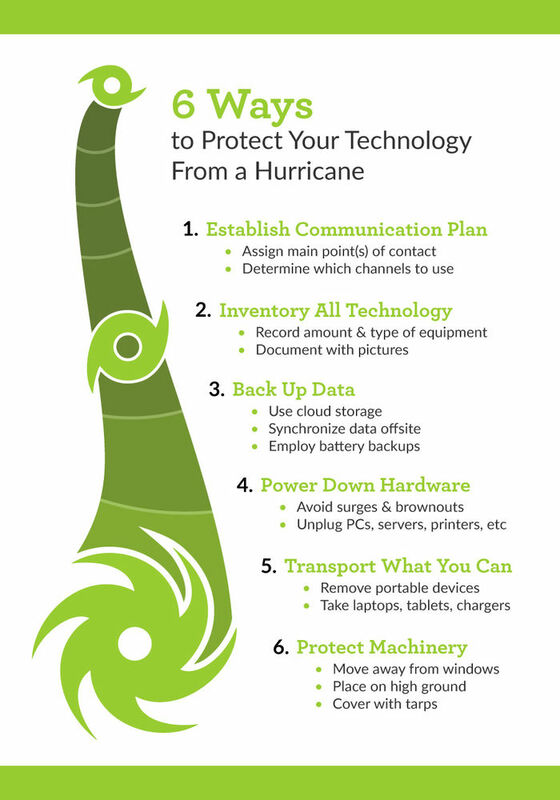 But, as an IT company we know that a technology continuity plan is just as important to have. Long before hurricane season begins, your company should create a comprehensive strategy for what steps to take before, during and after any type of emergency situation. Just as important as creating a technology continuity plan, it's crucial to distribute the information to your entire company so everyone is on the same page. With tropical cyclones expected to increase in intensity and frequency as the 21st century progresses, it's critical to make a plan now. Commit these six tips to memory and share with your team! Don't leave your technology to chance. Our team of experts can help you create the plan that's right for your business. iVenture Solutions is an award-winning managed service provider delivering superior IT solutions to clients across Florida. As a leading-edge IT firm for small and medium-sized businesses, we provide a diverse range of services covering the entire scope of IT including maintenance, support, hosting and more. Through rapid response time, reduction of chaos and the right people, our expert team of IT professionals will fulfill your technology needs. At iVenture, we give you more time to do what matters most.